This article is about the locality in Bangalore. For the locality in Mysore, see Jayaprakash Nagar Mysore. 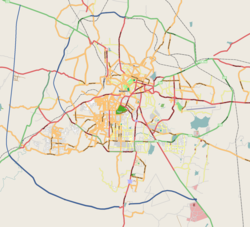 Jayaprakash Narayan Nagara, popularly known as J. P. Nagar, is an established residential area located in the south of the Bangalore conurbation, India named after prominent Indian leader Jayaprakash Narayan. It is located in proximity to prime residential areas such as Jayanagar, Banashankari, Bannerghatta Road and BTM Layout. The locality in South Bangalore began purely as a residential area but gradually transformed into a cosmopolitan area with opportunity for both residential and commercial projects. This transformation was a result of the boom of colleges and IT industries being set up in the vicinity. Previously it had bungalows and independent houses but the IT boom in the late 1990s converted it into a semi-Jaya Prakashnarayan Nagar, popularly known as JP Nagar, is an upmarket residential and commercial locality. It is surrounded by Jayanagar, Banashankari, Bannerghatta Road and BTM Layout. It is located between Bannerghatta road and Kanakapura road. JP Nagar contains some famous lakes, such as sarakki lake, Puttenahalli Lake (JP Nagar), Jaraganahalli Lake, Chunchugatta lake, Konanakunte Lake, Avalahalli Lake, Krishna Nagar Lake and so on. Over the years, because of massive urbanization, some of these lakes shrank and became polluted and some lakes, such as Jaraganahalli Lake, were entirely encroached by private parties. It was developed in two stages. Metro work has begun in Bannerghatta road in 2018. Wikimedia Commons has media related to J. P. Nagar. This page was last edited on 20 January 2019, at 21:24 (UTC).